Women’s Work- Am I Irish or English? Identity lies at the very heart of ‘Women’s Lives’ a new play by Anna Mae Mangan, better known for her best selling London Irish memoir ‘Me and Mine’. The oldest character in the play, Nora, is defiant but confused by having so many memories excavated by dementia. There is little connection left with her Irish heritage, her family, her past – the very realities which underpin our sense of self. Nora’s past is most definitely now a different country. At the other end of the spectrum, we meet Nora’s grand- daughter Eilis for whom her Irish identity is paramount. Dementia and Alzheimer’s is a cruel condition, slowly but inexorably stripping away the narrative we all need for our lives to make sense. Along with loss of memory comes the erosion of personality, mood changes and problems with communication and reasoning. All of this is both frightening and confusing for sufferers and carers alike. It’s hard to know the right things to say or do as dementia sufferers dip in and out of lucidity then being obsessed by formless fears. The Irish in Britain organisation’s has a strategy called Cuimhne, from the Irish word for memory. They campaign vigorously in support of age related forgetfulness, dementia and Alzheimer’s amongst the Irish community in Britain. Cuimhne, point out that it can be particularly difficult for Irish people to talk openly about this issue. Many would rather talk to another Irish person about their symptoms than a GP or nurse. Many hate discussing their concerns or hate any fuss being made. Please click here for more information. According to Wikipedia the term “Plastic Paddy” is a term for” members of the Irish diaspora who appear to appropriate stereotypical Irish customs and identity”. The term has also been applied to those with no ancestral connection to Ireland or who claim Irish identity or nationality. Many Irish born people,who have lived in England for a long time as well as second and third generation Irish like these at London’s St Patrick’s day parade, resent the term which seems to mock them. They are proud of their culture and make no apologies for celebrating it ! They do however, think that it is richer than the wearing of “Guinness” hats and other “shamrockery”. 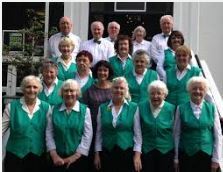 No one is more proud of their heritage that the Irish Pensioners choir who perform and record Irish ballads . This choir brings together around 30 older Irish people, most of whom are in their 70s and 80s. They come from all over Ireland and have made their homes here in London over many decades. 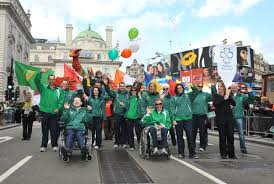 They have performed in front of tens of thousands including at the St Patrick’s Day concert in Trafalgar Square and at the Royal Albert Hall at the state visit of President Higgins in 2014. They are not only great ambassadors for people of advancing years but a tribute to the country of their birth. Click here to listen to actress Lesley Molony who plays Moya in “Women’s Work” speak about, how her previous job as a nurse helped her understanding of the play.